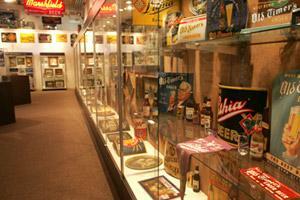 Are you looking for activities to enhance your stay? The communities surrounding Lake Joy Campground most likely will have what you need. 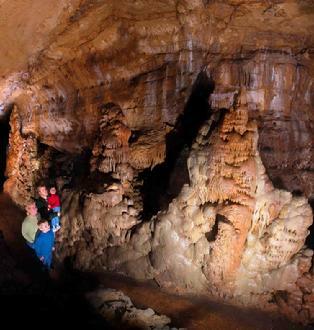 Whether you enjoy ATVing, canoeing, hiking, biking, visiting historic sites, touring southwest Wisconsin's beauty by car, taking in a museum or casino gambling, you'll find it here. Lake Joy Campground has direct access to the multi-use Tri-County Trails located 2 miles south of Lake Joy Campground. You can drive ATV's from your campsite to the Tri-County Trails without the need to trailer them to a central staging area. This trail system is beautiful in any season as it weaves through forests, past dairy farms and over scenic ridges of native wild flowers and past small towns on the path of a former railroad bed. The trail is extremely popular with ATV's and dirt bikes. The trail is also open to hikers, bicyclists, cross-country skiers, snow mobiles and those riding horses. If you enjoy the friendliness of small rural communities, then a visit to Mineral Point and the restored mining community of Pendarvis should be a stop during your stay at Lake Joy. 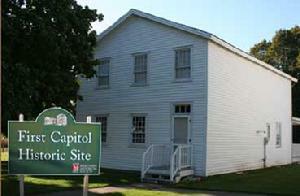 This town was settled by Cornish miners in the 1830's and still retains much of its original character. 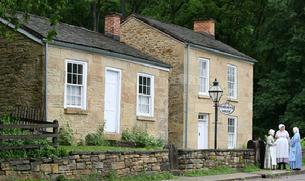 Mineral Point's streets are lined with Victorian homes as well as some of the "rock houses" built by the miners. 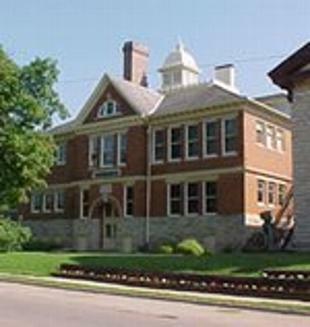 Mineral Point also offers many shops, including artisan galleries, working studios, antique shops, specialty shops, restaurants, inns and Bed and Breakfasts. 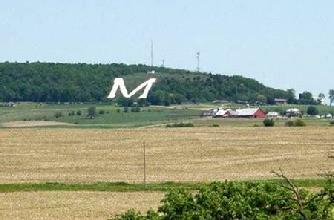 The University of Wisconsin - Platteville "M"
The idea to create the world's largest M is credited to Raymond Medley and Alvin Knoerr from the University of Wisconsin - Platteville. They took a winter hike in 1936 and trudged up and down the sides of the Platte Mound in about two feet of snow to form a huge "M". The next Spring, U.W.P. engineering students moved and cemented 400 tons of light-colored limestone to create the letter. The "M", a symbol of the old School of Mines, is 241 feet high, 214 feet wide, and the legs are 25 feet across. The engineers who designed it used surveying techniques to ensure that the "M" appears symmetrical from all angles. 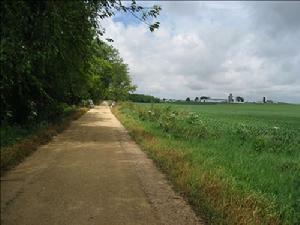 The "M" is found on Platte Mound, County Trunk B, on Hiawatha Pioneer Trail, about 4 miles east of Platteville. There is parking at the site and visitors can climb to the top to view the beautiful area around Platteville. Father Mathias Wernerus shaped and built the "Holy Ghost Grotto" between 1925 and 1931. It is unique in its combination of religious and patriotic-themed areas. 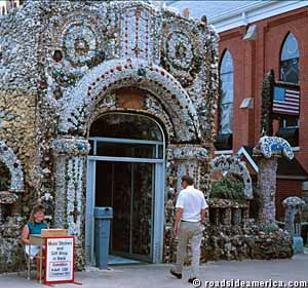 The Dickeyville grotto is not the largest such structure in the Midwest, but it has continually inspired visitors to go home and make their own creations. Every surface of the grotto is covered with bright colors, patriotic and religious symbols. A visit to the grotto is an experience that engages the visitor on many levels, from the overt symbolism down to the simplest of designs set in concrete. 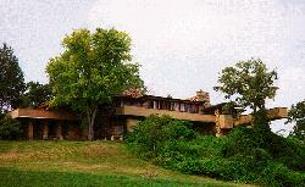 Less than one hour north of Lake Joy Campground sitting atop the rolling hills of Spring Green is Taliesin, the studio of Frank Lloyd Wright, America's greatest architect. 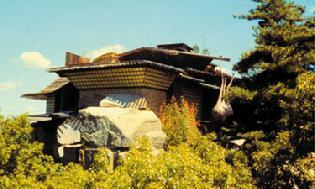 Taliesin, is regarded as an eminent example of Wright's vision of Organic Architecture, and the 600 acre estate includes buildings Wright continued to adapt and modify over 70 years of his career. 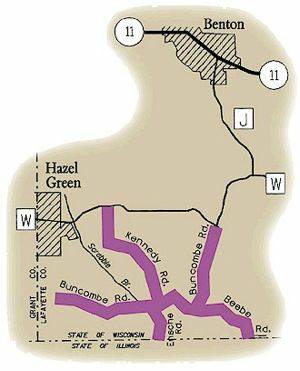 In the early 1970's the State of Wisconsin created the "Rustic Roads System". All such designated roads have outstanding natural features, native vegetation and native wildlife that preserves what remains of Wisconsin's scenic, lightly traveled country roads. Rustic Road R-66 is located in Lafayette County just off Highway W east of Hazel Green. 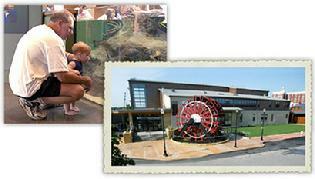 It is 7.5 miles in length and winds through the hilly fields and farmlands of this unglaciated region of the state. R-66 provides beautiful Autumn colors and year round scenery along its tree-lined roads. If one travels along Kennedy Road, they will see an abandoned lead mine with tin shacks, mine tailings and rusted ore buckets still visible, a reminder of this area's lead mining history.